Eden Housing Developers has launched fully developed Homes for its customers. 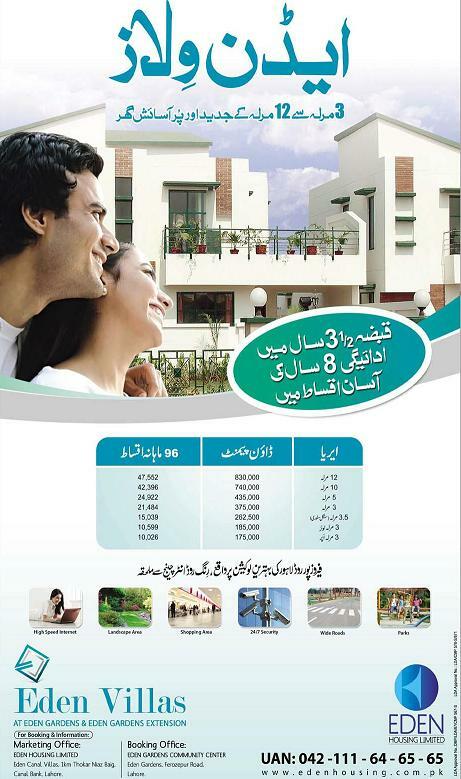 Eden Villas are located at Ferozepur Road, besides Ring Road Interchange Lahore. Eden Villas will be in different Sizes from 3 Marla to 12 Marla. I’m interested to buy a 5 Marlas house in Eden Garden society, if anyone is interested selling his house please drop me an email with asking price and house detail, number of bedroom, baths and house condition. you may also file a civil suit under specific relief act for delivery possession but it will take most of your time. Wait and Wait is the only solution. Pakistan has no courts or Department against the Deen-e-Quaid-e-Azam. If you have Money you fuk everthing. Otherwise wait and Wait when GOD crush Pakistan. Contact to Haqooqulabad, Pakistan. They will help you in the matter. Dear plz send me the complete installment schedule plan included all extra charges of 5 and 10 Marla. any parson sell r purchase a house in eden lane villas-2, please Contact. Mr Kashif 03351437890.
i am another suferer,anyone can tell fate of our investment. EDEN IS NAME OF DISHONEST GROUP. eden garden project is giving very hard time to me and my fmily. In fact as per their committment they are failed to handover possession in time. additional installments are badly effected my kids education plan. time will never come back i can not return good time of my children due to Eden Garden Project. EDEN IS A FRUD GROUP AND NOT PROVIDE ANY FACILITY. We bought Eden Housing 5 Marla 2nd floor appartment in Sep 2008 as per contract they had to handover this house in July 2009 despite repeated reminders no such postive response recived from Eden Housing yet. And now after delay of four years they have sent an letter asking for extra Rs. 1,000,000/- as an escalation charges which is tatally illegitimate. Hi i bought a plot at Eden Land (Ferozpur Road Lahore). Have paid all the installments but still no possession. This is very hard earn money. I can’t afford it to loose. Today i heard a news at that Eden Gardens has submitted a security deposit cheque as ordered by the supreme court. Is it true? i want to purchase 5 marla plot so whts the price??? are you — or have money to book your 3 marla house in eden. Give this money to any poor family and earn a villa in HEAVEN. salam i want to bok 3 marla plot plz tell me how can i? 1. Eden Lane Villas 1 they handover possesion in 2010 (4 years late) but there is no Gas and internet even today. 2. Eden Lane Villas 2, they promiss completion in 2008 but still not delivered. Few houses delivered but no gas, phone and internet. 3. Eden Abad, promise in 2010, but not delivered so far, now people are going to contact Supreme Court of Pakistan for Fraud. 5. Eden Meadows and Eden Garden Extension. It is more than one year of Eden Meadows, no map and no land. This company did not give map in more than one year how will they give u plot. They are saying that LDA is not approving their map and according to LDA, they don’t have any land there. My name is Qasim Khan, I am victim of Eden Abad and I sent application against Eden to FIA, NAB and Supreme Court Lahore Bench. I contacted media and one of TV channel invited me to discuss issue. You will see me on TV soon against this bloody group. if you want to sale your eden thing, please contact at 0300 8480342. I am not a broker..
Can you send details, We have action commete. They are Fraud PLS DONT BOOK ANY FURTHER PLOTS OR PAY ANY INSTALLMENTS.